Hamas gunmen used Palestinian children as human shields, and established command centers and Qassam launch pads in and near more than 100 mosques andhospitals during Operation Cast Lead in the Gaza Strip last year, according to a new Israeli report being released on Monday that aims to counter criticism of the IDF. 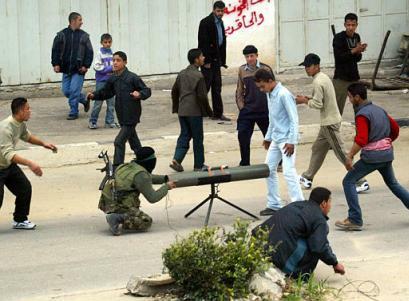 Hamas using kids as human shields. The IDF and the Shin Bet (Israel Security Agency) cooperated with the report’s authors and declassified hundreds of photographs, videos, prisoner interrogations and Hamas-drawn sketches as part of an effort to counter the criticism leveled at Israel in the UN-sponsored Goldstone Report. Work on the Malam report began immediately after former judge Richard Goldstone issued his damning report of Israel’s offensive in the Gaza Strip in September. 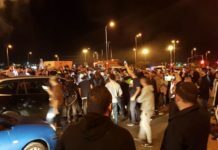 “The Goldstone Report is one-sided, biased, selective and deceptive, since it simply accepts Hamas claims at face value and presents everything through Hamas’s eyes,” Erlich said. The Malam report also provides an analysis of another sketch found during the offensive in the Atatra neighborhood in northern Gaza City that Erlich said proves Hamas’s culpability for the ensuing death and destruction. 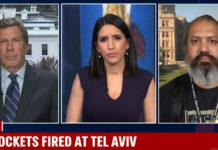 “By placing all of their weaponry next to homes, by operating out of homes, mosques and hospitals, by firing rockets next to schools and by using human shields, Hamas is the one responsible for the civilian deaths during the operation,” Erlich said. This note, Malam’s report said, was a clear indication of how Hamas took over civilian homes to use to attack Israeli forces. The intelligence information is backed up by videos, including one declassified air force video from January 6, 2009, which shows a terrorist shooting at troops from the roof of a building. After spotting an Israeli aircraft, the terrorist goes to the building’s entrance and calls to nearby civilians to help him escape. A few moments later, a group of children arrive at the entrance to the home and the terrorist walks out. Another video from January 13 shows a senior Hamas terrorist – spotted by an aircraft – walking by himself down a street. After spotting the aircraft, the senior terrorist runs over to an elderly woman walking nearby and continues walking next to her. Later, the IDF discovered that the “elderly woman” was really a Hamas operative in disguise. 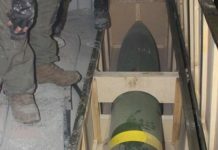 In response, Malam interviewed a number of IDF officers who provided testimony that a vast majority of Hamas fighters were dressed as civilians, and Hamas videos that showed fighters – during the Israeli offensive – wearing civilian clothing while firing mortars and rocket-propelled grenades at IDF troops. The Malam report has an entire section on Hamas’s use of mosques, revealing intelligence information that Hamas used almost 100 mosques inside Gaza to fight against the IDF. “Hamas systematically used mosques as part of its combat doctrine,” the report alleges, in contrast to Goldstone’s report, which claims that the mission was unable to make a determination about the issue. The report also details Hamas’s use of hospitals during the offensive, providing evidence that Hamas fired at IDF troops adjacent to and hid weaponry and senior operatives inside at least eight hospitals in the Gaza Strip. The Malam report devotes an entire section to proving how Hamas’s police and internal security forces were involved in military/terrorist activities and were not, as Goldstone claimed, civilian entities whose only duty was enforcing law and order. In contrast to the report the IDF is working on and plans to release in the coming months that focuses on IDF operations, Malam’s report is about Hamas, its combat tactics and the way it operates from within densely populated urban centers in Gaza, as well as the events that led up to Cast Lead in late December 2008 that Malam says were disregarded by Goldstone. The report points to four basic flaws in the Goldstone Report: It does not deal with the nature of Hamas – its terrorist aspects and ideology; it minimizes the gravity of the terrorist attacks against Israel, focusing on rocket fire during the six months before Operation Cast Lead while devoting little space to the rocket and mortar fire that began in 2001; it does not deal with the Hamas military buildup in the Gaza Strip in the year preceding Cast Lead that threatened Israel, but at the same time did provide extensive historical coverage of the Israeli-Palestinian conflict; and it ignored the role Iran and Syria play in Gaza by aiding Hamas and supplying it with explosives and weaponry. Thank you for your information! I am one of those in Norway that support Israel . I don’t believe all the lies from the medias. I just want to encourage your work, and I am thankful for it. In my congregation here in VedavÃ¥gen (western Norway) – evangelical congregation – we arrange a meeting one thuesday every month. On these meetings we bring news from Israel and try to give the people true information about what is going on. Greetings with the words from 2.Chron. chapter 32, verses 7 and 8. May the Lord bless you in Sderot and all of Israel. 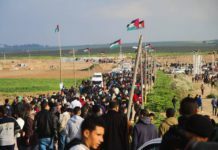 From looking at the picture – it does not SEEM the youths are there being forced into shielding positions by Hamas members. They rather look like they are there voluntarily – so how can it be said based upon a picture of young boys milling around a man with a machine gun that they are being used as human shield by Hamas when clearly it could just as easily be argued there were there because THEY wanted in on the fight?? The point about children as human shields is not about whether the children have been brainwashed into participating eagerly in war. Some have been. It is about Israel’s desire not to kill children and how the world sees children killed in war. Hamas knows that Israel does not want to kill children for both moral and political reasons. So, Hamas’s strategy is to have children gathered around a lauch site to prevent or inhibit Israel’s ability to defend itself by eliminating that site. Unfotunately, if a Palestinain launch site is allowed to operate it threatens the lives of those targeted. War rarely offers good choices and, in the heat of battle, poor choices are sometimes made. Sometimes soldiers may have no choice but to attack, while other times, there may be an alternative. 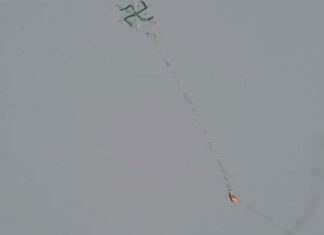 The bottom line is that if Hamas hadn’t encouraged the shooting of thousands of missiles from Gaza at civilian targets like schools and hospitals in Israel in an attempt to goad Israel into war, so that it could try to use the deaths of its civilians put Israel on the defensive internationally, in the hope that it would lead to the end of Israel, the Gaza war wouldn’t have have happened and the tragedies associated with the war would never have taken place.